This Little Ebook has been compiled with the object of laying before the public a Recipe Ebook for America's most popular fruit. 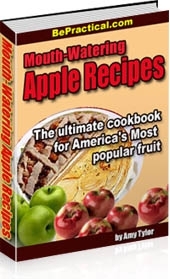 This Apple Recipe Ebook will be useful not only to vegetarians, but also to flesh eaters. The book has been prepared with great care. Almost all the recipes have been well tested. Many of them repeatedly tested myself and some of the recipes are obtained from my friends. I desire to record my gratitude here to the friends who have sent me recipes from their own collections as well as from public domain content. Put Sliced Apples in a baking pan and Sprinkle with lemon juice. Combine all dry ingredients with butter or melted margarine and mix with a fork until crumbly. Sprinkle all this over apples and bake at 350 degrees for at least 30 minutes. Peel, quarter and core cooking apples. Cut apple quarters into thin slices and place it in a bowl. Blend nutmeg and cinnamon then sprinkle over apples. Sprinkle with lemon rind. Add lemon juice and toss to blend. Arrange slices in a large baking dish. Make a mixture of sugar, flour and butter in a mixing bowl then put over apples, smoothing it over. Place the dish in the oven. If dish is very full, put a pan under the dish to catch spills. Bake at 370° for 60 minutes, until browned and apples are tender.